In this issue of Endoscopy, Park et al. compare the safety of endoscopic papillary large balloon dilation (EPLBD) with vs. without preceding endoscopic sphincterotomy (EST) in patients with large ( ≥ 10 mm) bile duct stones . There was no difference in adverse events for EPLBD with vs. without EST (4 % vs. 6 %, respectively), and specifically no difference in postendoscopic retrograde cholangiopancreatography (ERCP) pancreatitis (PEP) (3 % vs. 1 %). There was also no difference in stone clearance between EPLBD with vs. without EST (88 % vs. 92 %). The study provides new data to fuel the longstanding controversy regarding the risk of papillary dilation without preceding sphincterotomy. Their work raises important questions about whether discrepant results among studies on this topic may be the consequence of differences in study population vs. patient selection. In the Park et al. study, only those with stones ≥ 10 mm in size were enrolled. Though counter-intuitive, papillary dilation without EST may be the safest and most efficacious approach when addressing larger stones. Many endoscopists have been apprehensive about papillary dilation since publication of the large multicenter American trial by Disario et al., in which endoscopic papillary dilation without EST for bile duct stone management was associated with much higher morbidity than EST alone (17.9 % vs. 3.3 %) . This difference was primarily the result of a very high rate of pancreatitis – 15.4 % among those managed by papillary dilation, which was fatal in two patients, compared with 0.3 % for EST. The results from the Disario study were consistent with, albeit more pronounced than, an earlier meta-analysis, which showed a significantly increased rate of PEP with papillary dilation of an intact sphincter for treatment of choledocholithiasis . Nevertheless, interest in papillary dilation for stone management resurged following the propagation of the technique of papillary dilation following EST – a maneuver that appears to reduce PEP by directing force away from the pancreas . This development has prompted interest in the comparison of EPLBD with or without EST. A recent network meta-analysis of these techniques indicated greater first procedure clearance for EPLBD with EST compared with EPLBD without EST (odds ratio [OR] 2.1, 95 % confidence interval [CI] 1.1 – 4.4), as well as a trend toward less pancreatitis (OR 0.7, 95 %CI 0.3 – 1.6) . Park et al. raise the question of whether the low rate of PEP and comparable outcomes among those managed by dilation without EST in their series may be due to the features of their study population . These features include a greater proportion of soft pigment stones and low prevalence of sphincter of Oddi dysfunction in their Asian population. Additionally, the patients in the trial were older; only one patient managed with EPLBD without EST was younger than 60 years and the mean age was 73 years. This reflects the trial of papillary dilation vs. EST by Bergman et al., in which the average age of patients undergoing papillary dilation was 72 years . In contradiction to the trial by Disario et al., in which the mean age of those undergoing dilation was 47 years, the Bergman study found no difference in PEP for papillary dilation vs. EST  . Nevertheless, there are crucial differences in the design of the Park et al. study. The randomized controlled trial (RCT) included only patients with large stones, defined as those ≥ 10 mm, whereas most previous reports included variable stone sizes, and many studies such as Disario et al. excluded patients with a stone diameter > 10 mm . The network meta-analysis favoring EPLBD following EST included patients with small and large stones . Previous American Society for Gastrointestinal Endoscopy guidelines on the evaluation and management of choledocholithiasis   are currently being updated. The updated review of the extant literature through November 2017 identified eight RCTs of EST vs. EPLBD without EST, nine RCTs of EST vs. EPLBD following EST, and three RCTs of EPLBD without EST vs. EPLBD following EST. Pairwise meta-analysis of these trials revealed no differences in PEP for EPLBD without EST vs. EST (OR 1.0, 95 %CI 0.5 – 2.0), EPLBD with EST vs. EST (OR 1.1, 95 %CI 0.4 – 1.1), and EPLBD without EST vs. EPLBD with EST (OR 1.0, 95 %CI 0.4 – 2.7). Thus, the world literature addressing the adverse events of papillary dilation for large stones accords with the findings of Park et al. There are several explanations why the risk of papillary dilation may be less for larger stones. 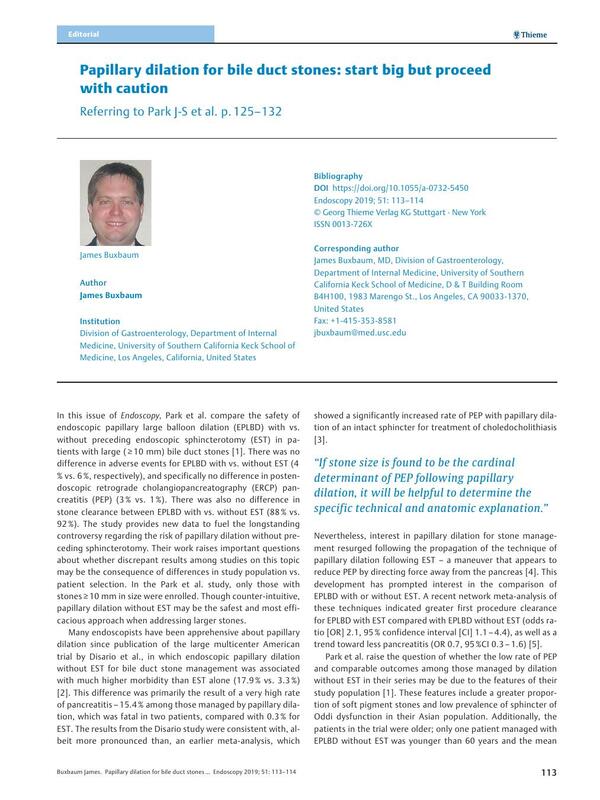 Potentially, the larger balloons needed for ≥ 10 mm stones may tear the papillary muscle and mitigate postprocedure spasm akin to what is seen in esophageal dilation. It is also plausible that the duct may be remodeled owing to the long-term dilatory force of a large stone rendering it less susceptible to mechanical trauma associated with removal. Future work is needed to determine whether differences in PEP following papillary dilation is actually due to the impact of the stone size or other features of the study population such as age, ethnicity, and geographic region. If stone size is found to be the cardinal determinant of PEP following papillary dilation, it will be helpful to determine the specific technical and anatomic explanation. These steps will help to more optimally match patients with choledocholithiasis to the best treatment approach and revise techniques to minimize risk.